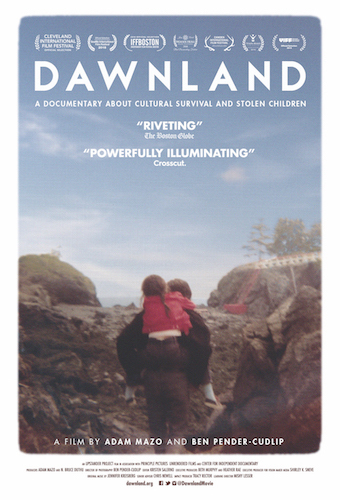 The University of Southern Maine Gloria S. Duclos Convocation presents a screening of the film “Dawnland ” in collaboration with the Upstander Project, MPBN, and Maine-Wabanaki REACH on Wednesday, December 5, 5:00 p.m., at Hannaford Hall, on the Portland Campus. Admission is free and open to the public, but tickets must be reserved in advance. This special evening will include a live concert and storytelling with performer and "Dawnland" composer Jennifer Kreisberg, Chris Newell and many special guests. Following the film, MPBN's Jennifer Rooks will moderate a discussion with the filmmakers, Adam Mazo and Ben Pender-Cudlip, co-creator of the truth commission Esther Anne of Maine-Wabanaki REACH, and film participant Dawn Neptune Adams. For decades, child welfare authorities have been forcibly removing Native American children from their homes to “save” them from being Indian. In Maine, the first official “truth and reconciliation commission” in the United States begins an unprecedented investigation. “Dawnland” goes behind-the-scenes as this historic body deals with difficult truths, questions the meaning of reconciliation, and charts a new course for state and tribal relations. Adam Mazo is the co-director and a producer of DAWNLAND and FIRST LIGHT (short doc, Camden, 2015). His hour-long film COEXIST focuses on a government experiment in forced reconciliation after the genocide in Rwanda. It aired on public television and WORLD Channel in 2014. He co-founded and leads the Upstander Project. Since 2009 the organization has been making films and learning resources, and leading teacher workshops to help people move toward being upstanders. Mazo has been a television news and documentary journalist for nearly two decades, with work appearing on major broadcast outlets. He is originally from Minnesota, graduated from the University of Florida, and now lives in Boston with his family. Ben Pender-Cudlip is the co-director and cinematographer of DAWNLAND. He is the director and photographer of over a dozen short documentary films, including the award-winning FIRST LIGHT (2015) with Adam Mazo. Together on DAWNLAND, they are Points North Fellows and Good Pitch alumni. Ben is also the winner of the Salem Film Festival’s Doc-a-chusetts Pitch with his new film, TETHYS, a feature documentary in production about artist Bob Schuler’s 30-year quest to bury his art at the bottom of the sea. Ben freelances as a non-fiction cinematographer, with clients including the New York Times, Harvard University, PBS FRONTLINE. He contributes regularly to independent documentaries, shooting in Boston and all over the world. He lives in Boston and graduated from Bard College at Simon’s Rock.